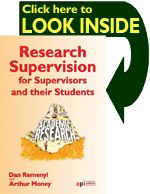 Research degrees remain a challenge for both supervisors and the researchers whom they are trying to help. It is more challenging than ever to find a good doctorial programme and it is difficult to manage all the different facets of a research degree that have to be attended to. Not everyone who thinks it is a good idea to undertake a research degree will be successful and this book indicates the characteristics which are required to produce high quality academic research. The book explores a number of important issues including the nature of theory development in academic research and how positivist and interpretivist research functions. The book discusses in detail how masters and doctorial degrees are evaluated and gives tips on how to be sure that the examiners will be satisfied with both the dissertation and during the viva. 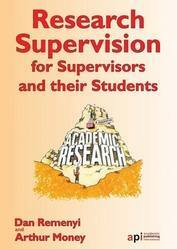 This book offers sound advice to both supervisors and their students, as to how to navigate their way through all the issues they have to face. In its second edition the book not only addresses the issues which have either changed or have developed since the first edition, but it also contains additional material which the authors believe will be a direct help to supervisors and their students. Click here to view the companion DVD to this book.